Feeding a baby is among the top concerns new parents have. 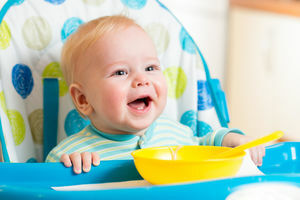 How do you know if your baby is getting enough to eat?Here you'll learn about baby nutrition. We'll teach you about formula, and when to start solid foods. We'll also explore bottlefeeding, help you with feeding problems, and go in depth about feeding your baby the first year. 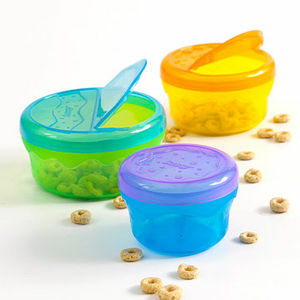 What to feed a baby who's between jar food and solids. Play it safe: Save these foods for when baby is older, as they may be dangerous for her to eat now. Let us take you through your first bottlefeeding experience. Take a page from our healthy-from-the-start handbook: There are loads of easy ways to feel close to the new love of your life, from feeding time to kangaroo care to simple smiles and lots of eye contact. When it comes to feeding your baby solid foods, variety is the spice of life. 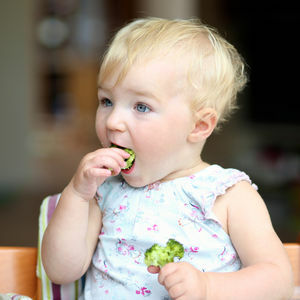 Research shows that the more fruits and vegetables a baby eats before age one, the more likely she is to eat a variety of produce by the time she's six. And when it comes to allergens like peanuts and eggs, pediatricians also recommend offering them to your baby before 12 months. So get cooking, mama! 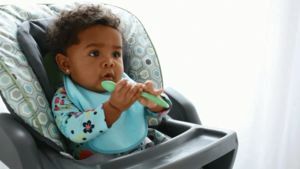 When it's time for your baby to start eating solid foods, the American Academy of Pediatrics suggests slowly introducing fruits, veggies, and meat one at a time to gauge baby's reaction to each new food. 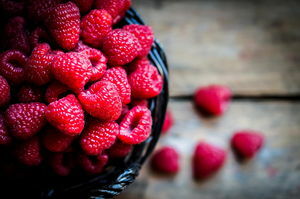 Here's our list of safe finger foods to gradually introduce into your child's diet. Am I wrong to give bananas to my 5-month-old daughter? 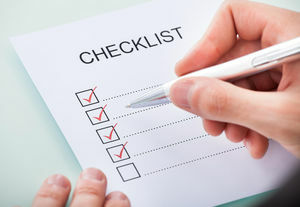 Grandparents, friends, and society flood parents with well-meaning advice, but how can Mom and Dad be sure they are receiving accurate information? With help from Dr. Andrew Adesman and his book "Baby Facts", we separate baby myths from reality. 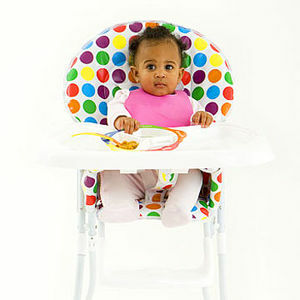 We've made it easy to feed your baby a healthy, balanced menu. This age-by-age guide to solid foods will ensure your baby gets all the nutrition she needs. Even though your baby can't tell you when he's hungry or full during his first year, he will still often take charge of feedings! 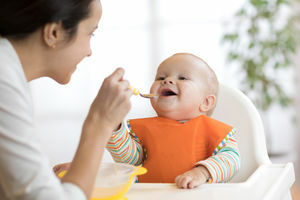 Learn how many ounces and how often to feed your baby every month based on guidelines from the American Academy of Pediatrics. Australian reality TV star Maddi Wright shared her struggle about choosing to breastfeed her baby and how it affected her as a parent. While it may seem a perfectly ordinary milestone in our little one's development, the process of introducing dairy to your baby does require some strategy. Get answers to your most-asked questions and learn the dos and don'ts of starting Baby on cow's milk. The proud mom of our new cover star tells us the story behind the contest-winning photo. Plus, see all of our adorable finalists! Research shows that the more fruits and veggies babies eat before age 1, the more likely they are to eat a variety of produce by age 6. Here are seven foods to feed your baby before age 1 (and how to prepare them!). 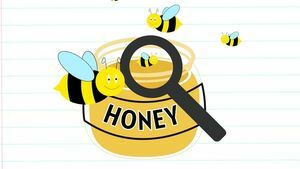 It can be hard to notice food-allergy symptoms in babies. Here's how to tell if your newborn could be suffering from one. 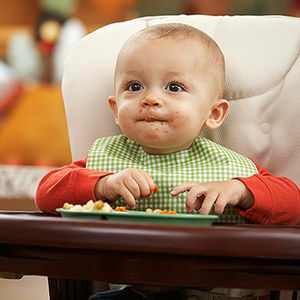 Quiz: Is Your Baby Ready to Get Started on Solids? 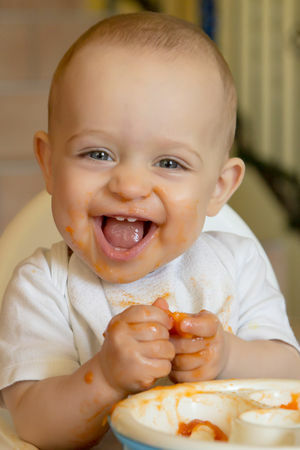 Sometime during your baby's first year, it'll be time to start adding solid foods to his diet. But how do you know when he's ready for a spoon and a high chair? Take our quiz and find out if it's time to start feeding your baby solids. Don't put your baby at risk for choking or an allergic reaction. Here are four foods you shouldn't feed your bundle of joy before her 1st birthday. A baby drinks the majority of her calories until about 7 to 10 months. So at mealtime, feed breast milk or formula first, before the solid food. At about 9 months, flip-flop the order and begin giving food first. The guidelines below are only suggestions of what to feed when, because all babies grow and develop at different rates. Because of their tiny tummies, babies don't eat much. That's why it's important to make sure the foods they do eat contain lots of nutrients. 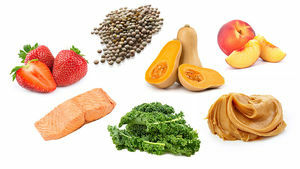 Learn how you can make the most of mealtime with your little one with this quick guide to age-appropriate power foods that pack a big nutritional punch. 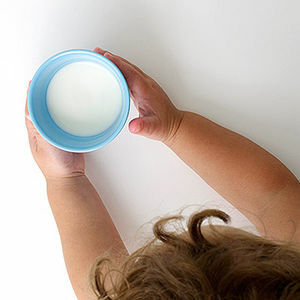 From the age of 1, solid food will replace much of the milk in your baby's diet. Try introducing a wider variety of foods, presented in an appealing way, and encourage your baby to feed himself. It's easier than you think to create fresh meals for your baby. 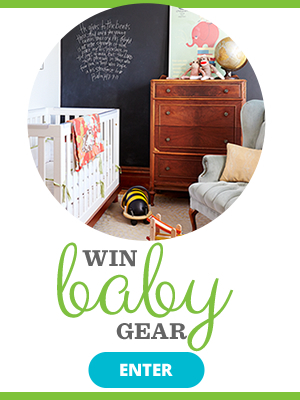 Confused about when and how to begin feeding your little one baby food? 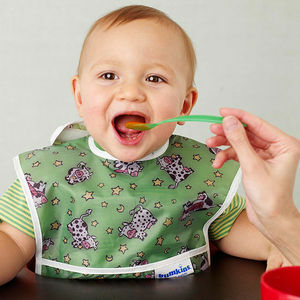 Here's a complete guide to starting solids from a pediatrician. Has a Breastfeeding Benefit Been Overhyped? New research suggests the link between breastfed babies and cognitive ability may not be as strong as previously believed. When can my baby start drinking water? It can be frustrating (and scary) when your once ravenous baby suddenly shuns spoon-feeding. But it's completely normal. Here's why it happens and how to adjust.